If you're a project manager, developing and adopting project management best practices is likely one of your top priorities. This article will share a comprehensive list of best practices for project management every organization needs. Are you happy with your project performance? Do your projects usually come in under budget and ahead of schedule? If you’re like most agencies, your answer will likely be “no”. Effective project management is often the “secret sauce” of an agency’s success, more so than sheer creative brilliance. Being good at managing projects is usually a matter of following project management best practices. These “best practices” are usually derived from project management methodologies, international standards, industry conventions, and the organization’s own guidelines from past projects. As PMI says, any “way of doing things” within an organization can be considered a best practice. Often, these “best practices” will vary from organization to organization. Some, however, are applicable across organizations and can radically improve project performance. I’ll share 15 such best practices below. A common factor in failed projects is a lack of uniform understanding of the project's requirements among stakeholders. If your project team and client have different estimations of the project's scope, you're going to run into problems. What are the project's deliverables? What are the project's goals and realized benefits? What is the expected product/service/result of the project? How do you define "success" for the project and its key deliverables? What defines the validity or completeness of the key deliverables? Are there any risks everyone should be aware of? What are the project budget, time, and performance constraints? Things can - and often will - go wrong. A key resource might drop out, a stakeholder might pull funding, and an important tech component might break. Ideally, you would have all these issues accounted for in your project risk management plan. Another best practice to mitigate risk is to create a risk response team. This team should be comprised of experienced members who have wide-ranging access to plan, monitor, and control risks in the project. Its most important job, however, is to swing into action in case of emergencies. The team should have the experience and training necessary to save projects when mishaps happen. Essentially, your risk response team should think of worst case scenarios and develop contingency plans. For instance, in a creative project, a few key resources dropping out can derail the project completely. In such a case, the risk response team would be tasked with finding backup resources, both within the company and outside it. Also read: Why creative projects fail (and what to do differently)? Project management isn't just the project manager's responsibility. If you dig deep, you'll find that several people within your organization perform some PM duties, formally and informally. One of the more popular project management best practices is to identify, develop, and formalize these roles. For example, a senior developer regularly assists the project manager in developing a schedule. While this developer might have experience, he doesn't have the formal knowledge or executive powers to perform his project management role adequately. A little bit of training and formalization of his role can help him become a better project scheduler. Carefully analyze your past projects and take stock of every person within the organization who played a role in project management. Ask yourself: Does this role need to be formalized? If yes, what certifications and training are necessary to improve performance in this role? You'll find that getting people to "level up" in their PM responsibilities takes the burden off the project manager and improves project performance across the board. Often, organizations focus too heavily on their project managers' technical competencies (i.e. their formal PM knowledge, certifications, etc.). As a result, the "softer" side of project management - leadership, empathy, people skills, etc. - suffers. Given how heavily project managers interface with clients and internal stakeholders, it is crucial that you help them develop their leadership competencies alongside their technical ones. Leadership capabilities are particularly important when you're dealing with a complex set of resources - as in an agency setting. You can't always develop a schedule for creative work and expect it to be 100% perfect every time. Often, you'll have to use leadership, motivation, and empathy to get creative talent to do its best. As Victoria Kumar says in a PMI paper - "leaders innovate; managers administer". Help your project managers develop their leadership skills and your projects will prosper. More than half of IT projects fail. 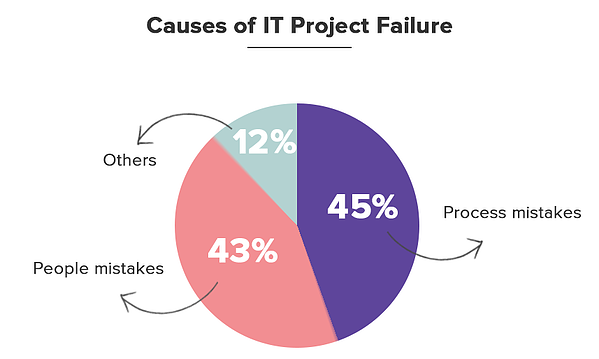 One meta-analysis of failed projects concluded that a vast majority of IT projects fail because of process mistakes (45%) or people mistakes (43%). If you're dealing with technical work, one of the most important things you can do to improve your success rate is to use better scheduling and estimations. Technical work has a tendency to "bloat" beyond your original estimates, leading to budget inflation and delivery delays. It doesn't help that the people involved in scheduling and estimating - project managers - often don't have an understanding of the actual technical issues involved. One way to solve this problem is to use developer-based estimating. This means giving over the reins to your development team and asking them to create a schedule. Since these are the people closest to the work, their estimates are liable to be more accurate. Other ways to improve scheduling is to use algorithms such as COCOMO II, historical data for similar projects, and scheduling software such as QSM SLIM-Estimate, SEER-SEM, etc. A common problem in creative projects is the rather ill-defined idea of "quality" all deliverables have to adhere to. What might be an excellent result for one client can be sub-par for another. You should have a clear idea as to what constitutes "quality" throughout the project's lifecycle. This must be based on standards acceptable to every stakeholder, especially the people on both sides who have to sign-off on the final deliverables. Break the project into multiple stages. Get stakeholders to sign-off on deliverables at each stage. Establish objective criteria for quality measurement. This can be hard for creative work, but comparing against industry benchmarks and the client's past projects works well. Document and share processes with stakeholders on both sides. Often, showing the path to the end result validates its quality as well. Establish a baseline for quality that all stakeholders agree to. As long as the project meets this baseline, it would be considered "successful". Back claims with data whenever you can. For example, if you want to show the impact of a new website design, run a quick A/B test to show how it compares to the previous one. "Transparency implies that in the hierarchy of management every employee will know what he or she needs to. 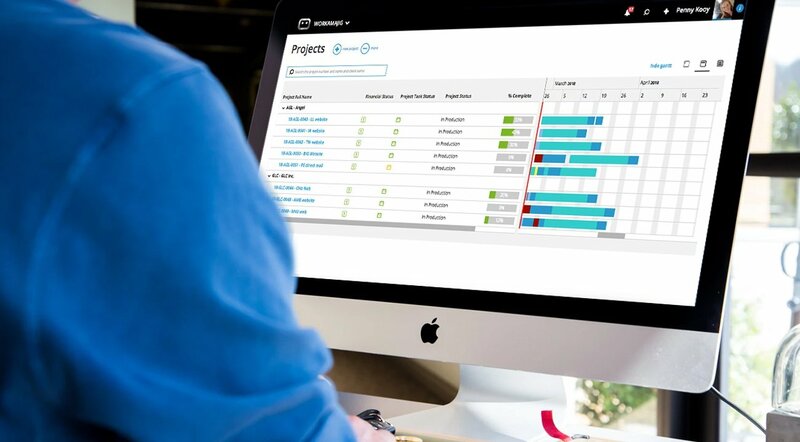 By enabling a transparent project management system, everyone benefits from those working on the project to those sponsoring and auditing it." Essentially, it means making your project data more open. Instead of simply assigning milestones to an individual, show them how their work ties into the rest of the project. This can create a greater sense of responsibility within the team ("I don't want to hold up my team members' work") and sense of achievement ("I helped build this crucial component"). Knowing how an individual's work interfaces with the rest of the team can also enhance teamwork and prevent projects from being derailed because of a single individual. Project communication: Enabling transparency in project communication helps team members see the entire process that leads to a decision, and not just the decision in itself. Opening up communication to everyone can also help in decision making by leveraging the "wisdom of the crowds" model. Project budget and time: Sharing the amount of budget and time consumed/available can help team members orient themselves better and evaluate their own priorities. You don't have to share detailed project budget data; just the part that impacts the team's work. Project changes: If there is any change in the project's scope, budget or deadline, keep your team cued in. Explain to them what exactly changed, why it changed, and how it impacts their work. This can improve team morale and help them trust you more. 8. Emphasize the project's "purpose"
In an earlier article on the collaboration habits of the world's best managers, we talked about the importance of highlighting the "why" of any project. This "why" is the purpose of the project, the project team, and their work. As E&Y's study reveals, purpose-driven organizations boast higher employee satisfaction, better quality products, and greater customer loyalty. Focusing on each project's purpose is crucial in an agency setting. It's common for one employee to work on multiple projects simultaneously within the agency. If the employee doesn't know how his work contributes to the project's or the business’ success, it can lead to long-term demotivation and dissatisfaction. This rule applies to outside contractors as well. Freelancers often have limited visibility into the project and the organization’s goals. This forces them to focus on short-term deliverables, not the long-term impact of their work. Solve this problem by focusing on the purpose and impact of the project. Share results - current or expected - with team members. Tell them how the project can help the client grow revenues, improve customer satisfaction, etc. If the project has an environmental component, make it clear to the team as well. In any agency, you’ll likely have a series of tasks that need to be performed on a regular basis on most projects. Sometimes, the people performing these tasks can become better at them simply by virtue of doing them repeatedly. A best practice to maximize the impact of your resources would be to create a “super team” of experts trained in specific, repetitive tasks. This team would not be affiliated with any particular project or team. Instead, they would move from project to project, performing just the target task. For example, a marketing agency might need to undertake an SEO audit for all new clients. Instead of a person within each team handling this task, you can create a team of SEOs who focus only on performing audits. This team would come in at the start of each project, run an SEO audit, and move on to the next project. Such specialization can bring in much-needed efficiencies if you work with a large number of similar clients. It is increasingly common for one employee in an agency to be a part of multiple teams. Contrary to popular belief, multiple team membership (MTM) can actually improve individual employee performance - until it doesn't. Being a part of several teams improves individual performance since the person gets exposed to different ideas and perspectives. However, once this improved performance hits its peak, the cognitive load of task switching and fragmented attention takes a toll. Beyond a point, being a part of any additional teams has a negative effect. As one study points out, MTM and performance follows an inverted U-shaped curve. Which is to say, there is a "Goldilocks Zone" of multiple team membership that is just right for individual and team performance. In 2015, Deloitte performed a wide-ranging study to evaluate its performance management system. The study revealed that for a majority of managers (58%), the existing system was inadequate in improving employee engagement and performance. To combat this, Deloitte completely overhauled its existing performance management system. And at the heart of the new system was the weekly check-in. Checking in regularly and frequently is one of the easiest project management best practices you can adopt, and certainly among the most impactful. Regular check-ins create a sense of accountability and shared responsibility between managers and team members. It tells your people that there is someone looking over their shoulder and is ready to help them improve, when necessary. Check-ins are even more important if you have remote employees. In a survey of 1,100 remote workers, 46% said that the most successful managers checked in regularly with them. The same study revealed that the frequency of check-ins doesn’t matter as much as the consistency. You can check-in daily, weekly, bi-weekly or monthly; as long as you do it on schedule every time, you will hold your team accountable. Your project management best practices will often spring from your organization's experiences and knowledge. Having all project-related data in a single place can help you leverage this past knowledge to deal with future issues. Think of consolidating all project-related information into a centralized knowledge base. Anyone working in project management related roles should be able to freely access this information. This can be a powerful resource for all current and future project managers. Keeping it up to date should be a priority for all project roles. It is inevitable that your team will stray from your originally conceived plans. They'll miss deadlines, go over-budget, and find risks not covered in your risk management plan. One best practice that can improve current and future project performance is to track all these deviations and correct them as quickly as possible. Gather reports and hold meetings regularly to identify when things are going off-target. As long as you are within the baseline originally stated in the project plan, you are doing well. Budgeted Cost of Work Performed (BCWP): Your planned budget for the work completed by any given date. Budgeted Cost of Work Scheduled (BCWS): Your planned budget for the work scheduled by any given date. The difference between BCWS and BCWP tells you how far you are from your original deadlines. Actual Cost of Work Performed (ACWP): How much of the budget you've actually used by any given date. The difference between ACWP and BCWP gives you the deviation from the project plan. Keeping a close eye on these metrics can help you take corrective measures before the project goes off-budget. A common cause of project failure is that important stakeholders and sponsors aren't alerted to issues until it is too late. Problems that can be solved by senior people often linger at the bottom of the organization for fear of rebuke or censure. You can combat this by creating an issue escalation process for the project. Escalate only one issue to only one stakeholder at a time. Don't involve stakeholders who aren't affected by the issue. The last, but certainly the most important best practice, is to practice empathy. Empathize with your clients, your resources, and your end users. Understand their problems, their needs, and their challenges. No project exists in isolation; if you're creating something, it will affect real people in some very real ways. Practicing empathy will help you understand the true impact of your work and how you can do it in the best possible way. Empathy is particularly important in creative agencies. The work you do will often go out in the world and be seen by thousands, even millions. It will impact careers and entire companies. Knowing how the project affects end users, clients, and stakeholders will help you deliver better results. There is no prescription for practice empathy; you just have to place yourself in the shoes of other people. Think of everyone involved in the project and how it affects them. Identify what they truly want to achieve with it. The client might want more sales, but the senior stakeholder might want to use the project to jockey for a promotion. Similarly, a stakeholder on your side might see the project as his "baby". His motivations to promote it will be very different from the client. Take cognizance of all these different perspectives when you're planning the project and you'll see your success rates skyrocket. There are countless other project management best practices. You might already be using some of them. Others might not benefit your organization at all. The important part is to track your own best practices, to adopt and test new ones, and to maintain a knowledge base that lists everything you do to improve your project management practices. What are some of your organization’s favorite best practices for project management? Share them with us below!